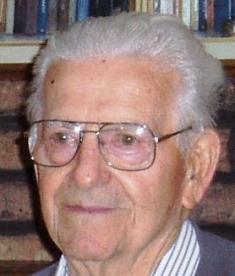 (Grafton, WI) Fillmore Emil Ott, 82, passed away peacefully Sunday, April 27, 2008 surrounded by his family. A first generation American, Phil was born in Menno, SD, November 7, 1925 to Josefa (Roloff) and Ferdinand Ott. A U.S. Navy World War II veteran, Phil traveled around the world, served aboard the USS New Mexico in the South Pacific and fought in many campaigns, including the Philippine and Aleutian Islands, and Okinawa. Phil was a recipient of the Purple Heart. Following military service, Phil was employed by Great Lakes Coal Co. as a crane operator, unloading coal boats from high atop the Port Washington, WI coal bridge. He also worked for Gaylord Container in Milwaukee and the Grafton School District from which he retired in 1991. Prior to his enlisting in the U.S. Navy, Phil met Bette Schmit, and they later married on November 26, 1949 at St. Joseph’s Rectory in Grafton, WI. Phil was a long time parish member and a member of American Legion Rose-Harms Post 355. He is survived by his wife of nearly 58 years, Bette: and their children, sons M. Scott (Maureen Carroll) Ott of La Crosse, WI; Steven F. (Deborah) Ott, of Billings, MT; daughter Suzanne J. (William) Hamer of Oshkosh, WI; grandchildren Stacy (Cayanne) Ott of Billings, MT; Jesse (Rachel) Ott of Billings, MT; Kadi Hamer and Christine Hamer both of Oshkosh, WI; step-grandchildren Bret (Paula) Hamer of Oshkosh, WI; and Keli (Joseph) Jezwinski of Oshkosh, WI; step-great grandchildren Jaycee Jezwinski and Emma Jezwinski of Oshkosh, WI; sister Irene Skruby of Port Washington, WI; sister and brother-in-law James and Vivian Miller of Port Washington, WI; brothers-in-law and sisters-in-law Gene and Rosemary Schmit and JoAnn and Richard Paulus of Grafton, WI. Phil is further survived by many nieces, nephews, and friends. Phil was predeceased by his parents, sister and brother-in-law Ida and Anthony Skridla; sister and brother-in-law Leona and Hardus Veen; nephew Charles Veen; brothers-in-law William Skruby and James Schmit; sister-in-law Ardell O’Sullivan; and father-in-law and mother-in-law Michael J. and Rosalia Schmit. Holy Requiem Mass will be celebrated at 12:30PM Saturday, May 3, 2008 at St. Joseph’s Catholic Church, 1619 Washington St. (Hwy. 60), Grafton, WI. Visitation will be at the church from 9:30 AM until time of service. Interment will be in St. Joseph’s Cemetery. In lieu of flowers, memorials may be directed to St. Joseph’s Catholic Church. Our grandpa was not only a wonderful man, but our hero and best friend. He was generous with his time, always helping with homework and teaching us all he knew about life. He will be missed greatly. Grandpa, we love you to the moon and back. We love you and miss you, Pa.